Rex prepping another incredible meal. 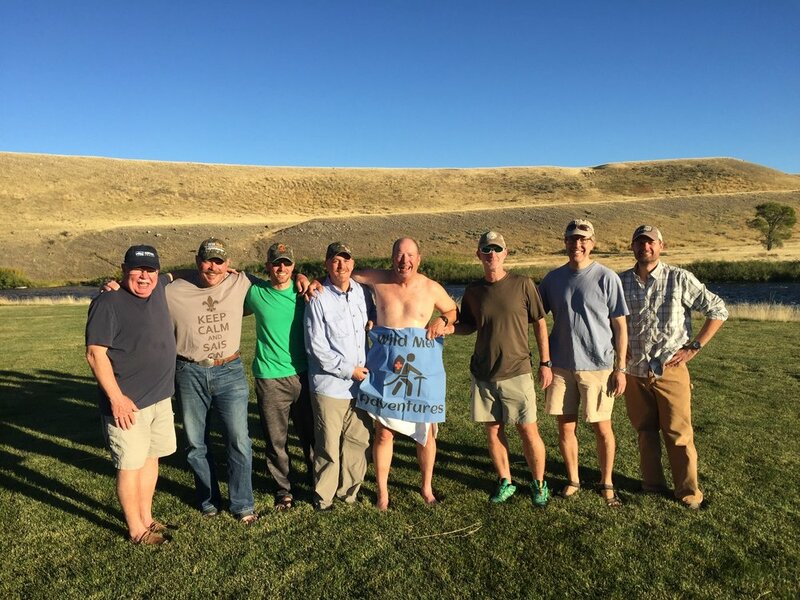 For the second consecutive year, Wild Med Adventures descended upon the Madison River Lodge near Ennis, MT for a week of education, camaraderie and fly fishing. The eight-man crew arrived on Sunday evening and was met by their hosts, Debi and Rex. As a harbinger of things to come, an enormous pile of steaks were being prepped in the kitchen as introductions were made and rooms were selected. The lodge, formerly a private residence, now owned and operated by Montana Angler, sits on a beautiful piece of land on the Madison River, between the Sphinx and Black Butte Mountains. As the bar opened (with several additions from Willie’s Distillery in Ennis) and the initial horseshoe battles ensued, the guests were called to dinner, the first of several gluttonous evening meals. Sufficed to say, no one went hungry this week. Monday morning arrived with a chill in the air as the thermometer had dipped below 30 degrees. After a hearty breakfast, we were fitted for boots and waders and hit the river. The eight of us split up with our four guides to fish various sections of the Madison. "Jerry's Fish Face ! " As an aside, any man that postpones his retirement for several weeks, so that he can use his CME money to go fly fishing, is a man worth befriending. There’s nothing quite like lunch and a beer while sitting in a drift boat in Montana. The weather warmed and the skies cleared, making the next two days of fishing tougher, but no less enjoyable. On Thursday, we were left unsupervised. No guides. No boats. No rigging or detangling assistance. This was a boon for some and an albatross for others. We had a “plan.” Unfortunately, no one really knew what it was. Splitting into two groups, we attacked the area “between the lakes;” at least that was “the plan.” Chris S. and Ben M., fishing in the questionable prohibited area below the damn (“We didn’t see the signs until later.”), were certified fish killers, landing loads of fish who had never seen flies before and couldn’t eat fast enough. Bob and Matt followed Adam’s (aka Meriwether Lewis) lead and went on an overland journey, as surely Beaver Creek leads to the Madison. Beaver Creek, being only popular with brown bears, yielded few fish and emptied into Quake Lake. Not to be confused with the Madison River. After what seemed several miles of walking, under the guidance of Meriwether Lewis, we located the Madison and fishing commenced. A long walk in chest-high waders was reminiscent of the steam shower back at the lodge and an excellent weight-loss technique. After several hours of frustration, Bob bailed out and headed to the Campground Café. Not an agreed upon rendezvous location (we didn’t have one), but a seemingly logical choice. While sitting on a rock working on his final tangle, he looked up to see Ben M., Ben O., Chris and Hector, driving away from the café. Despite valiant attempts to hail them, he was left behind. If not for the kindness of strangers, he might still be there. Ultimately, all of the party was accounted for. Chris offered some alternative coping strategies for a tough day on the water and we searched for Adam (“let’s talk about your phone”). Hector’s unbridled enthusiasm and positivity was only marginally dampened by Ben M.’s attempts to crash into several guardrails. As tales were woven, shoes were thrown and drinks were consumed, laughter was the theme of our last night. As a group photo was organized, Jerry had gone missing. Napping perchance? Too many cocktails? No. He was in the shower. But as time waits for no man, his attire for posterity was a simple bath towel and a Wild Med Adventures flag. Jerry Gone Missing . . .
You’re never as prepared as you think you are. A fifty percent swim rate is about average. Forty-eight hours in a zip-lock full of rice can revive an iPhone. All creeks do not lead to the Madison. Fifty in a 25 is BS. Cheesy popcorn is NOT for desert. Hillbilly dentistry is definitely cheaper than seeing an oral surgeon. When in doubt, always UPGREYEDD. Oh, and by the way, we also had some great lectures on ballistics, ATV injuries, animal recognition and bites, HAPE, HACE, hypothermia, and blisters. Just to name a few. Newer PostWild Med Adventures Instructor - Dr. Ben Church heads to Nepal.